The two men claimed to be AAP workers unhappy with the party leadership and Satyender Jain who is being probed for corruption. Assembly Speaker later ordered them to be jailed for one month in jail. NEW DELHI: Aam Aadmi Party lawmakers punched, kicked and slapped a man inside the Delhi Assembly premises as he was being led away along with a second visitor by security personnel on Wednesday afternoon. The two men had just been evicted from the assembly's public gallery for throwing flyers from seats earmarked for the public and shouting 'Inquilab Zindabad', an urdu phrase that translates to Long Live the Revolution. The target of their campaign was Satyendar Jain, the health minister in the Arvind Kejriwal-led Aam Aadmi Party government who has been target of incessant attacks from sacked water minister Kapil Mishra. Minutes earlier, assembly Speaker Ram Niwas Goel had ordered security guards to remove the two men from the visitors' gallery. 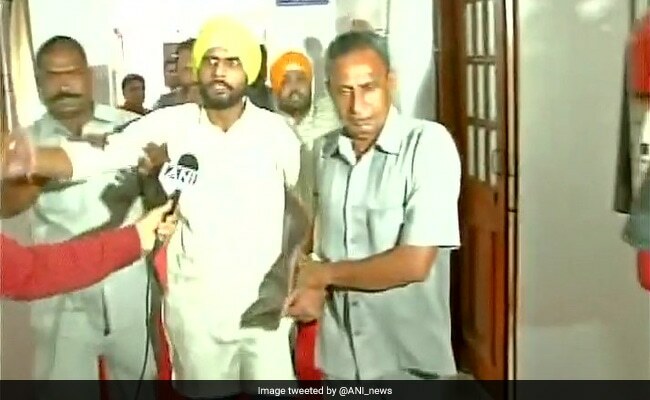 The two visitors were being escorted out when red-faced AAP legislators angry at the attempt to create ruckus inside, snatched one of them from the security officers and started thrashing him. In the flyers that they had thrown inside, the two men claimed to be AAP workers who were unhappy with the party leadership and Satyender Jain who is being probed for corruption. Suspended AAP lawmaker Kapil Mishra - who has relentlessly targeted Chief Minister Arvind Kejriwal - called the police. It is not clear if the two visitors are linked to Mishra. Last month, the sacked minister too had accused AAP lawmakers of beating him up in the assembly. Chief Minister Arvind Kejriwal and Deputy Chief Minister Manish Sisodia refused to comment on the violence in the assembly premises by AAP legislators. A PTI report later said Speaker Ram Niwas Goel had ordered the two men to be imprisoned for one month as punishment for breach of privilege of the assembly.